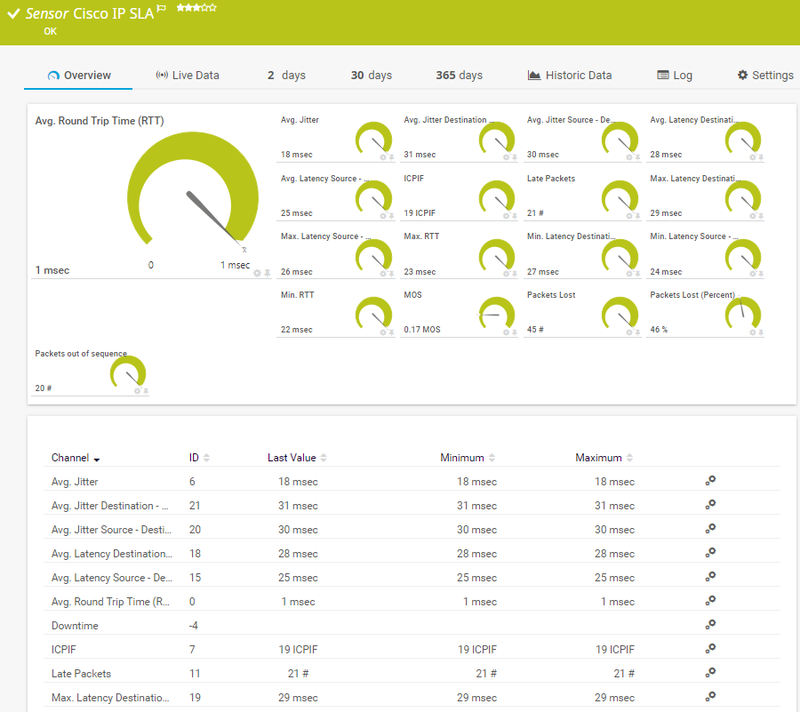 The Cisco IP SLA sensor monitors Voice over IP (VoIP) network parameters using IP Service Level Agreement (SLA) from Cisco via Simple Network Management Protocol (SNMP). For a general introduction to the technology behind Quality of Service monitoring, please see manual section Monitoring Quality of Service. Select which SLAs you want to monitor. PRTG creates one sensor for each SLA you select in the Add Sensor dialog. The settings you choose in this dialog are valid for all of the sensors that are created. Select the IP SLAs you want to add a sensor for. You see a list with the names of all items which are available to monitor. Select the desired items by adding check marks in front of the respective lines. PRTG creates one sensor for each selection. You can also select and deselect all items by using the check box in the table head. Note: The numbers above are the IDs of the SLA types as reported by the target device. PRTG translates them into the corresponding strings. These IDs are independent from the IDs which you see in the first column of the list. If the target device returns other values than given above, the sensor will show an error message that it cannot find the type. These fields show SLA specific settings which the queried SLA device provides. Once a sensor is created, you cannot change this value. It is shown for reference purposes only. If you need to change this, please add the sensor anew.